All governors are volunteers and do not receive any payment for their work. They do play a vital role in the work of the school. 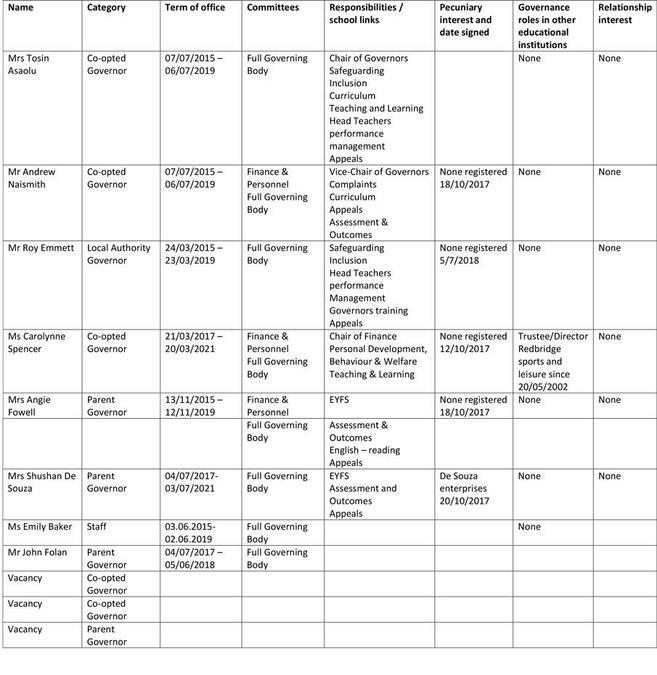 A full governors meeting is held once each half term with additional meetings for the individual committees. The governing body of the school has three key roles for setting strategic direction, ensuring accountability and monitoring and evaluating school performance. The governors are accountable to the local authority for the way in which the school is run. Governors monitor and evaluate progress and regularly review the framework of the school. In all these areas the governors are advised by the Head teacher. The School Development Plan will generally provide the main mechanism for the strategic planning process. The head teacher has the responsibility for the internal organisation, management and control of the school and for the implementation of the strategic frame work established by the governing body. Governors are not expected to be involved in the day to day management of the school. The head teacher discusses all main aspects of school life with the governing body and will expect governors to both challenge and support the school in its improvement. Acting as a critical friend, governors should seek to question and gain information to enable them to make the best decisions for the school. This governing body has delegated sufficient powers to the head teacher to enable him/her perform his/her management duties as effectively as possible. In his/her turn the Head teacher must report regularly to the governors on how those delegated powers have been exercised.